There are many types of plastic molds, although ACO Mold plastic injection molding factory can’t make the all types of plastic molds, we are confident in making plastic molds commonly seen in the market. We have more than 10 years experience in provide one-stop services of R&D, mold making, plastic injection molding and product assembly etc. The technology of our company covers a wide range of the customization of plastic injection molds such as electronic products, children's education, and security equipment etc. For a plastic injection molding factory located in Shenzhen China, we should have both soft and hard strength to meet customer’s requirements of custom mold making and plastic injection molding. We have made custom injection molds for 300+ customers from global companies, such as Europe and American company. So we have rich experience in custom mold making. ACO Mold plastic injection molding factory undertakes the processing of electronic injection molded casings, including Bluetooth earphone casings, children's educational products, smart wearable devices, and related electronic plastic casing molds. Selecting molds according to specific needs of company. We provide efficient injection molding, one-stop plastic mold making service. ACO Mold injection molding company undertakes plastic injection molding, such as smart bracelet shell, reel shell, smart wearable shell injection molding, charger plastic parts processing, etc. We provide one-stop plastic processing services of mold making & plastic molding product assembly etc. We can offer fast shipping, help your company quickly lead the market! ACO Mold injection molding supplier undertakes a variety of 3C electronic products, security injection mold processing, including security GPS locator molds, smart wearable molds, point pen molds, camera shell molds, inspection instrument molds and other plastic shell molds. We provide one-stop plastic processing services from mold design to plastic molding. We provide customized injection molding solutions for security shells from individual mold R&D to large volume plastic molding! ACO Mold plastic injection molding factory has more than 5,000 square meters of workshops, 20 sets of advanced automatic injection molding machines, 2 modern spraying lines, and other production equipments such as CNC, spark machine, and grinding machine etc. We have more than 10 years of industry experience to provide one-stop services of injection mold manufacturing, plastic molding, and oil screen printing etc. With more than 100 senior technical personnel, it provides professional advice and services to company. ACO Mold injection molding plant equipped with various mold processing equipment. We have ability of mold R&D, have the ability to provide one-stop plastic processing service. 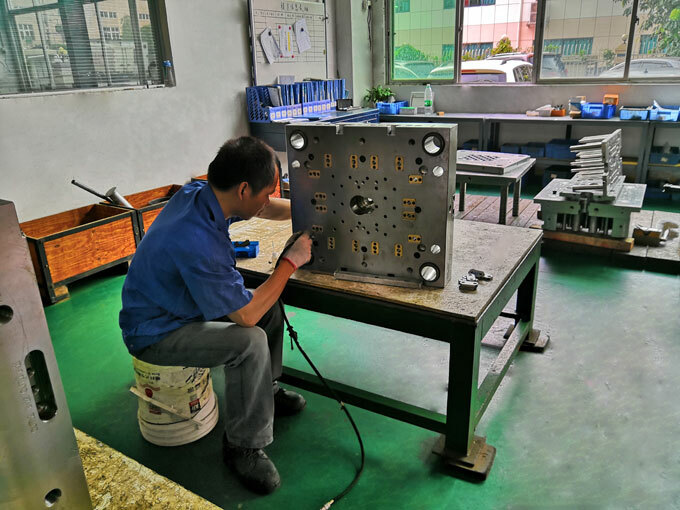 ACO Mold pays close attention to plastic product quality, adopts advanced high-precision testing equipment, conducts inspections in strict accordance with the inspection instructions, and the professional quality engineer team guarantees the high-end quality of mold injection. The quality control system runs through all aspects of mold selection-process development-injection molding-product spraying, so the quality control system is perfect. ACO Mold customizing plastic injection molds for plastic parts from global company. We provide one-stop plastic molding service to ensure timely delivery of products. We follow the whole process from order taking, mold design and mold making plastic molding to shipment. ACO Mold is plastic injection molding factory located in Shenzhen China. We provide one-stop injection molding mold making service. We have more than 10 years experience in plastic manufacturing industry. In order to provide high-quality injection mold, we equipped advanced a series of equipment such as CNC machining center, engraving machine, spark machine, wire cutting, grinding machine, milling machine, drilling machine and lathe etc. Below is something you need to know about ACO Mold injection molding mold making. Are you still confused about finding a reliable Chinese injection molding supplier? Welcome to ACO Mold, we will customize the mold for your plastic products. If your product is still in the concept stage, you only need to present your ideas, product features and appearance requirements. Our engineers will give you the best solution, recommend the most suitable materials, and help you take the lead in the market. We look forward to working with you on the next project to create the perfect product! SO welcome to the contact page above to get a free quote! How to select a Chinese injection mold supplier? The major reason that American and European companies source plastic injection molds in China is price, at the end of the day that is the major factor. However if we want to have a feel good ... Reliable injection molding manufacturers in China How to choose reliable injection molding manufacturers? This question is believed to be of concern to many companies. A reliable injection molder supplier is not only a guarantee of product quality ... Heat treatment in injection mold manufacturing In order to make the injection mold precise and high-quality, injection molding manufacturing will heat the injection molds. It can not only improve the precision of the injection molds, but also ... Troubleshooting: mold making project for nylon molded parts Last year we have made 2 sets of injection molds for a US company, the part we are going to mold is made in nylon, also called PA6, it looks like a simple part, but in actual practice, a few problems ... Guiding Mechanism Design of Injection Mold The injection mold parts in motion are guided by guide pins and guide sleeves. To ensure the a accuracy of injection, mold open and clamp, guiding system is essential.